Teaching kids martial arts is hard work but ultimately rewarding for everyone. Source: Alison Todd. 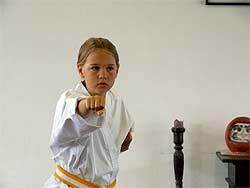 If you believe everything you read in the forums and parenting magazines you’d think that simply enrolling a child in a martial art class is a miraculous remedy for their challenging behaviour. Even peer review journals (Palermo et al. 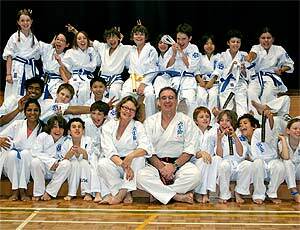 2006, Nosanchuk & MacNeil 1989) describe the positive behavioural change in children after joining a martial arts school. Obviously the transformation must be fairly straightforward – or so I believed. I first started teaching kids about 15 years ago. Our school had grown to such an extent that we needed to add separate children’s classes. I’d previously only taught karate to adults and found it relatively straightforward so didn’t think I’d have any trouble with a children’s class. I did some research on teaching kids and was ready to make remarkable changes to these small creatures. A small class of about 5 kids quickly grew to 20; different ages, different grades and only one instructor: me. Add to the mix at least one child with a diagnosed behavioural disorder and then on occasion those who because of the environment also exhibited challenging behaviour, I was not having much fun at all. In fact it was awful. Theoretically it was supposed to be easy. It wasn’t. Something had to change. On review it seemed that there were two main stumbling blocks to establishing a successful class for the instructor, the students’ with challenging behaviour and the rest of the children in the class. Firstly I needed to develop a different skill set to manage the class and secondly I desperately needed at least one regular assistant. Ideally the ratio of instructor to kids should be 1:8. If you have a new student with ADHD, Opposition Defiant Disorder, Asperger Syndrome or Autism Spectrum Disorder the ratio should be nearer 1:4. However getting an assistant is often extremely difficult. If you are from a small school there probably aren’t enough students to draw from or if you have a larger school, the kids’ classes start too early for those who are working. Even if there are people available, trying to convince these students to help is often not easy. Regrettably there just isn’t the allure or kudos of teaching kids as there is in teaching in the adult program. What could I do? The fundamental principle of any behaviour strategy is that the only behaviour you can truly control is your own (Konza et al. 2004). So rather than focus on the (lack of) availability of assistants, I needed to identify what changes I could make to my interaction with them to improve their conduct. If I could do this then the class should improve for everyone. A martial art offers the benefit of providing a clear, predictable, uncomplicated foundation for a class. The bow in, warm up, build up of technical material through the class and bow out is a great framework for these kids. Typically we train with very little equipment so unlike other physical activities a child may do our training halls are free from distractions. 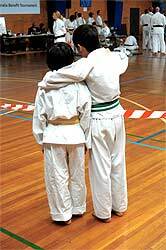 Conversely it is also the rigidity of the martial art that can also create problems for the instructor. Successful kids’ classes also differ from a more traditional adults’ class in terms of activity. To keep attention levels up and distraction levels down there needs to be less talk and more action. The general rule of thumb is to introduce a change of activity every 10 minutes. Normally this can be done with drills however most experienced instructors develop a repertoire of games to keep the kids occupied. The best source of ideas is from senior members of your school or style. It is also useful to look at what is available in print and on the internet. It is surprising how quickly you can get together your own unique set of drills and games for your class. Generally I’d say that when I am teaching I don’t ‘sweat the small stuff’. Most of what kids get up to can simply be ignored. However even with the best of planning sometimes things just go wrong and there comes a point when you must step in. Rather than rely on punitive punishments, which rarely work on these kids anyway, I try to focus on the child's ability and effort. I endeavor to reframe the child's actions in a pro-active way. The child needs to be reminded that they are able to do the correct behaviour and you have confidence in them being able to do it (Morgan et al. 2005). Using positive, clear, unambiguous behaviour is the way I do this. 1. Not: I'm very disappointed in you. Rather: From now on you will have to ... before you can ..
3. Not: Stop mucking around Caitlin and give it a go. Rather: You can do it Caitlin. This is similar to what we did last week and you are very good at this. I have faith in you. 1. Damien you are pushing in. You may hurt someone. It is important you wait your turn. I know you can do it because last week at training you managed to wait and you got to have another go. 2. You are lying down/spinning Zenith. It is dangerous if you lie on the floor/spin. You may hurt someone. 3. You are hitting Tansy. Tansy can't concentrate if you do this. Please focus on what you are doing. 4. Wendy you are not paying attention. It is dangerous if you do not pay attention during the drill/game. You may get hurt. With patience and perseverance by the instructor even the most distracted child will ultimately become focused. After a particularly disruptive class I found it useful to remind myself two things: firstly everyone has bad days (including me). And secondly I need to try and separate what I felt had happened (the focus is on the child) to what I had observed had happened (the focus is on the behaviour). I also regularly review my class to find out what is working and what is not. The result is I found that by simply trying to understand the kids that were most disruptive and difficult, the overall standard of my teaching as well as the performance and behaviour of all my students improved. When teaching challenging kids it is best to remember that nothing is a quick fix. Most kids take a month or so to settle. The more difficult kids about 6 months. Those with more entrenched problems up to 18 months, sometimes even longer. The fact is like any behavioural modification strategy, to get these kids engaged, keep them motivated and limit their disruptive behaviour takes enormous amounts of support, planning, time and patience on the part of the instructor. Is it worth it? Definitely. The tougher kids actually aren’t so bad after all. In fact in many cases they turned out to be the ones I ended up having the most fun with. I persevered and remain relatively unscathed. It really is worth all the effort. Konza, D., Grainger, J. and Bradshaw, K. 2004. Classroom Management. A Survival Guide. Social Science Press, Australia. Nosanchuk, T. A. and MacNeil, M. L. C. 1989. Examination of the effects of traditional and modern martial arts training on aggressiveness. Aggressive Behaviour. 15 (2) 153-159. Alison Todd started Seido karate in Auckland, NewZealand in 1986. In 1989 she moved with her husband to Sydney Australia.. In 1994 she received her shodan. Two compassionate educators and talented karate-ka shaped her approach to teaching martial arts: Jun Shihan Nancy Lanoue, Thousand Waves, Chicago, Illinois and Kyoshi Bu Windsor, Aoraki Mount Cook Seido karate, New Zealand. She has been fortunate to train under Kaicho Tadashi Nakamura. She continues to study Seido karate with Jun Shihan Ino Maquirang in Sydney Australia. Alison’s martial interests lie in looking at ways to engage all types of kids in karate. She especially likes the challenge of those kids who view the world just a little differently from the rest of us. Alison also spent a brief time as an academic where she published book reviews, lay articles for industry magazines, in peer review journals and the occasional book chapter. She now divides her time between teaching kids’ classes, raising money for charity and writing for suite101.com. Her challenge is to continue to do this with ever diminishing eyesight.